As the Spring homebuying season picks up, many realtors are choosing to market their homes to potential buyers using aerial still images and video content captured on drones. Drone footage is changing the way realtors and homeowners, and commercial landlords market property in all regions around the country. For example, drone photography and videography lets anyone create stunning, realistic aerial images at a low cost. This allows potential homebuyers to get an idea of what the home looks like inside and out before purchasing or seeing the house in-person. The use of drones when marketing a home or commercial building can also generate buzz for local real estate agencies and the realtors who work with them, as it sets them apart from others attempting to sell property in a specific area. According to TechHelpline, 770,000 drones are currently registered with the FAA for use with real estate photography and beyond (http://www.techhelpline.com/drones-real-estate-marketing/). This proves that drone imaging is a powerful tool and will become essential to marketing real estate properties and beyond. Drone usage can also be a great tool for inspecting areas of a home which were difficult to examine before, such as roofs and chimneys. It can also be useful when capturing images inside a property with large ceilings and high floors. Recently, the team at Ellenbogen Creative Media was hired by one of the Hudson Valley’s largest real estate companies to work with one of their clients and our FAA licensed drone pilots and create a video about a local property for sale in Accord, NY. The house is on a large-scale property of over 130 acres. The home gave the Ellenbogen staff the opportunity to capture footage from hundreds of feet in the air. When filming content, it was important to the real estate agent that we operate the drone in the Spring so we could get a clear image of the woodlands without having views blocked by the nearby trees. 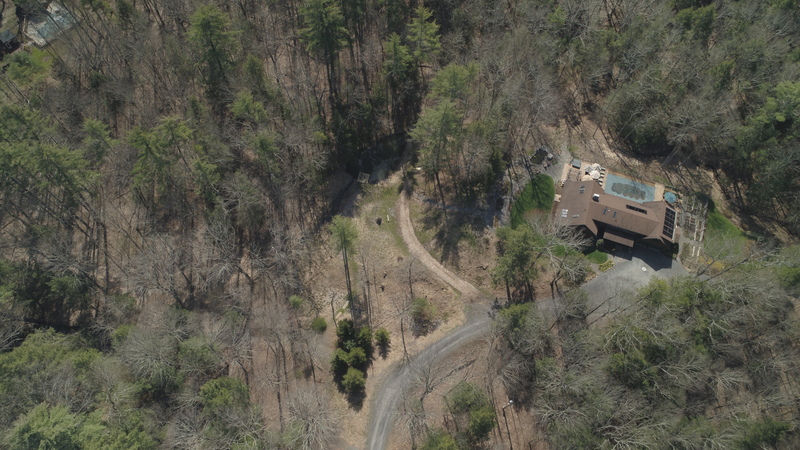 Since the home also features a swimming pool, multiple gardens, and a sprawling forest in the backyard, it was essential to have drones film the entire property to capture everything it has to offer future buyers. The final video featuring this property will be edited into a two minute piece and will be featured on social media and multiple real estate listings. To find out how drone usage can help you market your real estate property, please contact, give us a call at 845-338-4336 or email us at info@ellenbogen.com. Lights, Camera, Chamber of Commerce! The Ulster County Chamber of Commerce recently hosted its monthly Breakfast Briefings event on April 24, 2018. The meeting discussed how businesses can use or update their digital marketing strategies to reach larger audiences and connect with new generations. 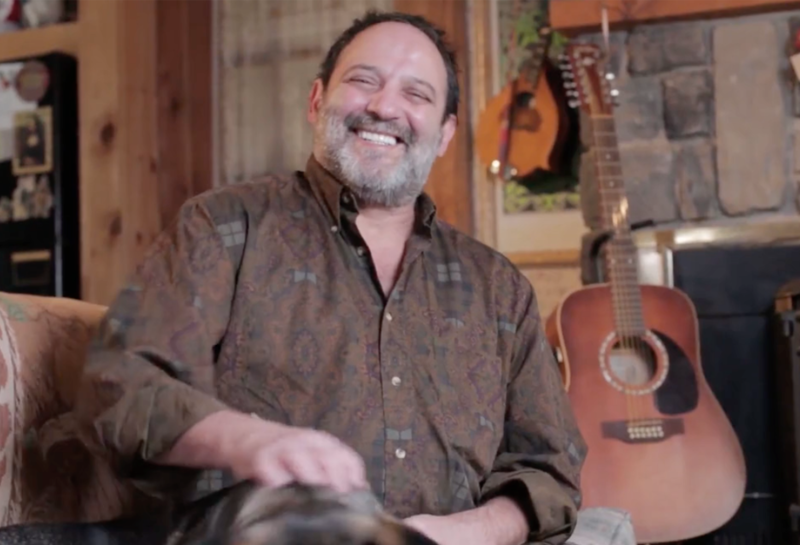 Jeremy Ellenbogen, CEO of Ellenbogen Creative Media, spoke about the ways businesses can use video content to market their services or products in the digital world. 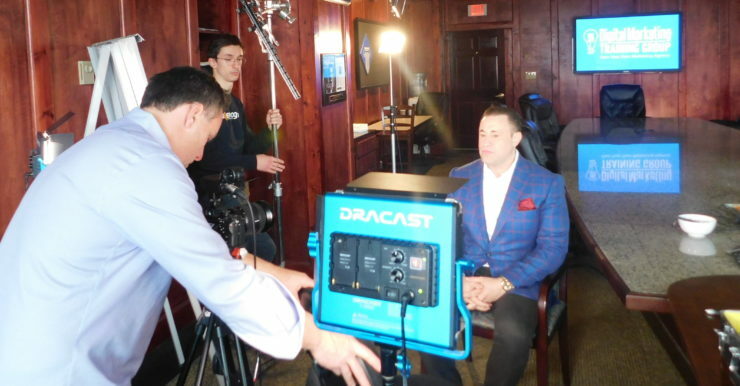 He presented the topic to representatives from the top businesses in Ulster County and provided them with insight into how digital video could connect businesses to audiences efficiently and effectively. Jeremy discussed the answers to eight different questions companies may have when beginning to create video content. These ranged from why companies would need video to how they could start making their own content that would benefit their business. He then went on to explain how video content can bring consumers to an organization and boost product sales. For example, he stated that adding video to a company website or social media post could increase the chance of action from consumers and bring more people to a website or service. It was also suggested that companies should attempt to produce as much video content as they can to ensure that demographics can follow along with their everyday workings and stay relevant with the public. According to the presentation, videos that manage to entertain, educate, and engage their audience will get consumers to pay attention to a company and their product or service. The best way that companies can begin to utilize video content is to simply start filming, and this can be done with any type of technology, ranging from smartphones to the latest and greatest cameras and sound equipment. Jeremy Ellenbogen also noted that the cost of creating videos has gone down since companies can share one video link on multiple social media platforms and even partner up with other companies to create video content that promotes the efforts of both teams, similar to cooperative advertising. He also cited some examples of Ellenbogen’s past projects with local businesses and beyond to show how great videos can make or break a businesses digital marketing strategy. He specifically mentioned how a time lapse video taken of a mural being painted went viral and reached audiences all over the world, promoting the work of audiences in the local area. Ellenbogen also produced an infographic video with Crown Maple of Dover Plains, NY explaining the differences between traditional table syrup found in most homes and true maple syrup. This video also went viral and is a great example of how content made in a timely, inexpensive manner with simple information can bring the most attention a product. The event ended with a brief question and answer session from Jeremy and the other speakers at the event, as well as a chance for the attendees to speak one-on-one with each other. Ellenbogen is at it again! This time, the crew traveled to Albany, NY to spend the day working with Digital Marketing Training Group, also known as DMTG. Throughout the day, the Ellenbogen Creative Media Team filmed promotional content for DMTG which will be featured on their website. DMTG aims to provide aspiring entrepreneurs with the knowledge and resources to lead their own marketing agencies no matter what type of experience they have in the field. The organization holds frequent, in-person classes in topics such as Search Engine Optimization, Content Marketing, and building an online presence. The video featured an on-camera discussion from upper-level executives about the services offered and the need for digital marketing in today’s economy. Founder Kris Roglieri and Marketing Director Joe Shaffer spoke directly about how digital marketing is important for all businesses when attempting to sell a service or product to the public, as well as how DMTG keeps up with the latest trends in the industry to serve their graduates and their clients in the best ways possible. The crew at Ellenbogen created a single camera setup for the videos and featured an array of sound and lighting equipment which produced smooth, clean content that will enhance DMTG’s online presence. They also utilized a Ronin-M gimbal stabilizer for b-roll footage of the staff working to achieve success in their everyday duties. The team at Digital Marketing Training Group has over 75 years of combined digital marketing experience. Many of the program’s graduates operate out of Albany and the surrounding areas. Founder and entrepreneur Kris Roglieri saw a need for a program which could provide those looking to promote businesses through online marketing tactics with the sources they would need to launch their careers.The staff at DMTG provides graduates of the program with support in generating tangible results for their clients, which can include anything from web design to technical support and analytics. DMTG’s training encourages graduates to gain clientele and run their business at their own pace while having 24/7 access to the supports they provide after the end of the program. Digital marketing is extremely important since many people are turning to devices such as smartphones and computers for their business, entertainment, and lifestyle needs. Consumers are using internet resources to become informed about various products and services now more than ever, which means many businesses have the opportunity to reach audiences who they usually do not target or reach in their campaigns. While traditional marketing methods continue to reach the same audiences with the messaging, digital marketing and advertising strategies may be the way to go when selling a product to future consumers. To find out more about the Digital Marketing Training Group and their work, visit their website at https://www.digitalmarketingbusiness.com. Orange County Executive Steve Neuhaus gave a State of the County Address on Wednesday, April 10. This is the fifth State of the County Address Neuhaus has given to discuss the progress being made in Orange County affairs. He was introduced by good friend Arnold Amthor, the Town of Montgomery and Village of Maybrook Police Chief. Overall, the address highlighted the many accomplishments of the past year, as well as his visions for the future of Orange County. Neuhaus has been working with the local legislature over the past year to ensure that Orange County will remain stronger than ever. A few of the accomplishments highlighted throughout the address are as follows: New classes were added to BOCES programs in the fields of Health Career Training and English as a second language. Stewart International Airport saw a spike in job creation thanks to the addition of Norwegian Airlines. The airport also saw a 63 percent increase in passenger volume. The county has also launched a new campaign aiming to inform local parents, students, educators, and law enforcement about the dangers of sexting and cyberbullying. Additionally, property values in the county are on the rise and sales tax revenue rose $15 million dollars in value between 2016 and 2017. The county will be implementing new initiatives over the next year to stay successful as well. Currently, the county is working with local medical providers to reduce health costs for local residents and focus on areas of health which were not specified in care before. In addition, the county will be implementing a program which allows drones to fly in medicine, such as epipens, to those without easy access to those medications. County Executive Neuhaus will also create a program to develop labor and trade apprenticeship requirements for those working on publicly financed construction projects. Ellenbogen Creative Media, based out of Kingston, NY, was responsible for gathering live, multi-camera footage of this event. This is Ellenbogen’s third year working with Orange County to film this event in conjunction and under the direction of Focus Media of Goshen, NY. Ellenbogen recorded the event via the Livestream Live Broadcasting website. Footage of the event was also shared on Orange County’s Government Website in its entirety. It was recorded in High Definition and Livestreamed for a large viewing audience. 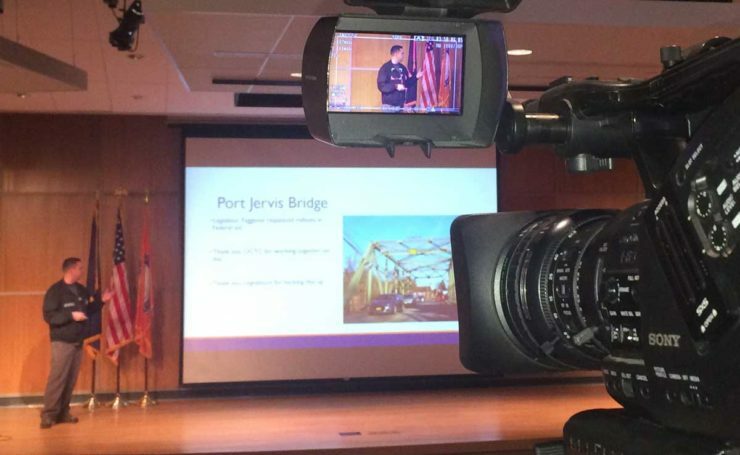 The footage from this event was also edited into roughly a two minute news reel video with a next-day turnaround by Ellenbogen’s own Steven Miele to ensure the content was released to the public in a timely manner. The Orange County State of the County Address was broadcasted live between two different cameras for a smooth, seamless look. For those not familiar with Live streaming, this is the concept of watching news happen as it is being filmed. Media, such as video content, is broadcasted in real time to viewers online or via social media in an effort to help them experience events as they are happening in real time. Live streaming is essential in political events and campaigns since it can ensure transparency between government officials and constituents in ways that other forms of media cannot. Live streaming also enables government officials to share information with people in a timely manner and helps them stay up-to-date on what is happening in their community and around the world. Teeth Tomorrow | Kenny Testimonial from Ellenbogen Creative Media on Vimeo. Our new fall semester interns have arrived! We are very excited to work with another great group from SUNY New Paltz! First up is senior, Samantha Pritchard, Digital Media Production major. “To say my first day interning at Ellenbogen Creative Media started off with a bang would be an understatement. Not only was I instantly greeted with the friendly and hilarious cast of employees; I also witnessed a very rare light bulb explosion (and minor fire thereafter)! To be honest, I was incredibly nervous walking into the building this morning, since I have never had and internship before. Those anxious fears were not long-lived, though, because everyone working here is very helpful and kind. Everyone welcomed any questions I asked and I can tell they were eager to help me learn. Originally I was expecting a slow first day filled with learning where everything was, doing my paperwork, and watching everyone else go about their daily tasks. 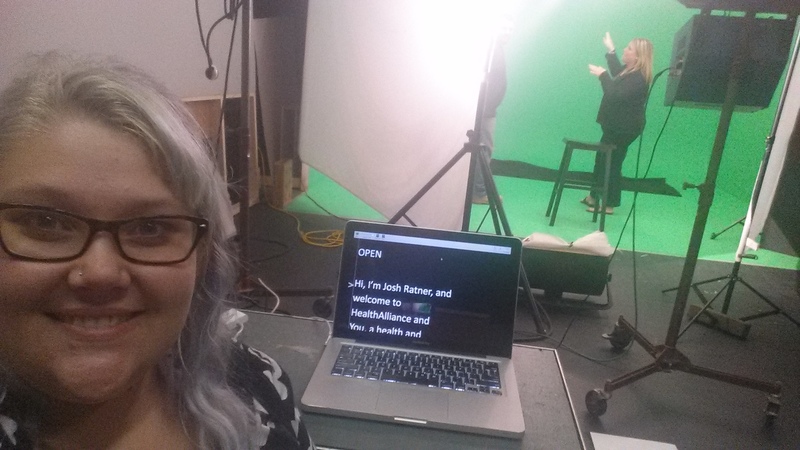 Only thirty minutes into the day and I was already behind the teleprompter on a video shoot! I was able to watch Amanda, the Production Manager, work with it for a few minutes before feeling confident enough in myself so I wouldn’t mess up the flow of the talent: Josh Ratner. The whole purpose of the shoot was to capture video segments for the Health Alliance of Hudson Valley’s series of helpful and informational videos about health and healing. The environment during the whole shoot was very calm and relaxed. My first day wasn’t all explosions and laughter, though. I was able to sit with editor, Ricardo Pineda, so that he could teach me more about Adobe Premiere, the editing software used here at Ellenbogen Creative Media. It amazed me how patient he was with my incessant questions about the program and I learned so much in those two hours; more than I learned during an entire semester of an editing class. 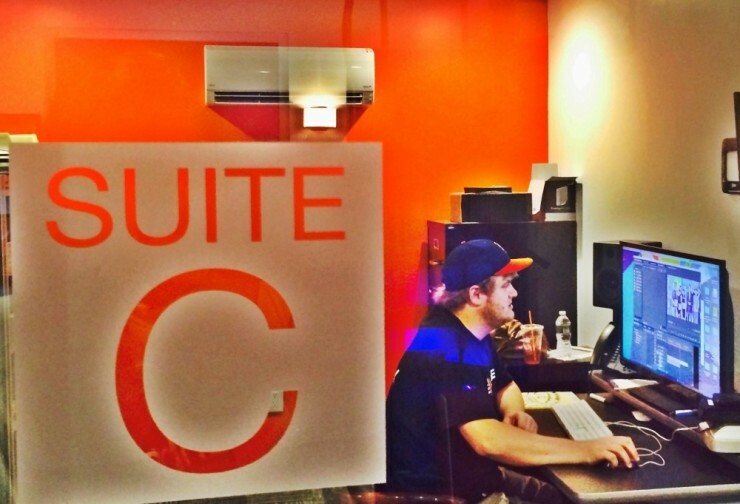 Things here are very hands-on which makes learning a much faster and smoother process. Instead of them just telling me how to work the teleprompter or how to put away the different microphones, they actually had me DO these tasks. As the sun rose on this beautiful July morning so did the Ellenbogen team. It was time to set forth on a long journey over the river (by way of the Tappan Zee Bridge) and through the woods (all the way down to Irvington, in Westchester County) to capture images of today’s targets. We arrived early and eager, ready to invade the homes of famous author, Washington Irving, and American Revolutionary patriot family, the Van Cortlandt’s. To the surprise of the team, it was a straight shot from Kingston to Sunnyside with no traffic interruptions. A perfect commute. We arrived at Sunnyside, that’s what Irving calls his estate, ready to take in the sights of America’s first internationally famous author remembered best for penning, “The Legend of Sleepy Hollow.” We weren’t afraid of what we might find as we meandered our way through beautiful curved pathways on the property. There were no headless horsemen greeting us…just breathtaking views of the Hudson River and his amazing home covered in flowers as though it sprouted from the ground. A true nature paradise right in Westchester County. Although we didn’t want to leave, we had another stop on today’s journey: Van Cortlandt Manor. This is the home of one of New York’s most prominent patriot families in the years just after the American Revolution. During their time in the house they dealt with pressing political issues, dealing with Federalist and Anti-Federalist debates over the drafting of the United States Constitution. We could only imagine being a guest in the home as our nation’s most important document was drafted…all while being served delicious meals from one of the largest and best-equipped colonial kitchens of it’s time in America! Van Cortlandt Manor is also home to a collection of furnishings from the colonial and federal periods in their original settings. 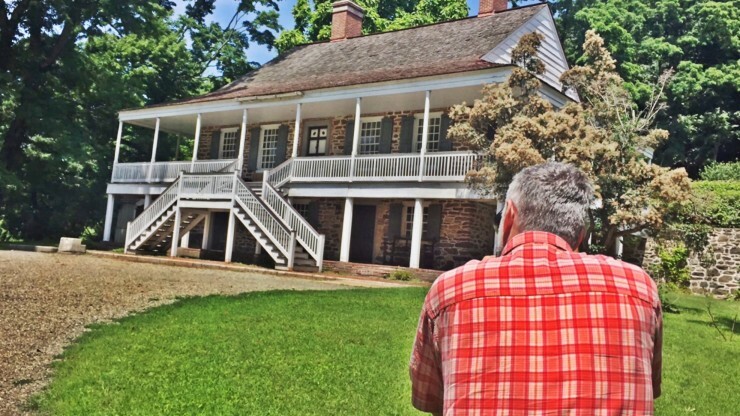 But the coolest feature the Van Cortlandt’s included on their property is the Ferry House, a rural tavern that offered food, drink, and lodging to travelers! 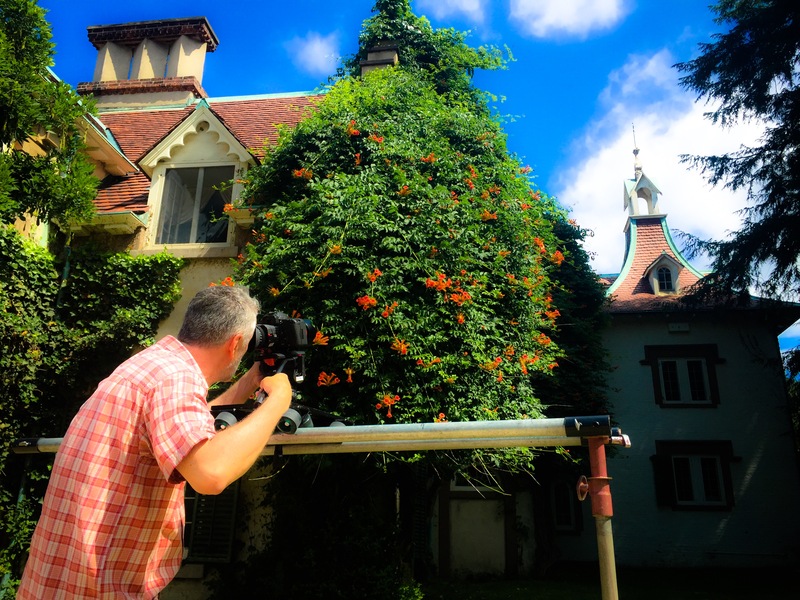 Today’s Mission: Do not pick flowers off Sunnyside’s exterior, remind Zoltan he cannot harass the historians to sell Sunnyside to him (it’s just not for sale! ), carve a pumpkin featuring the faces of our crew and get it in the Great Jack O’Lantern Blaze at Van Cortlandt Manor this fall (With over 6,000 Jack O’Lanterns on display…what’s one more!) and finally, build our own Ferry House.